There are better ways to loosen up those toe straps. Toe strap bindings on your snowboard allow for more flexibility and sharper turns, but if they're ratcheted too tightly, they can cut off your circulation and make your feet even colder than they already are. Fortunately, the ratchet design that holds your foot firmly in place is fully adjustable, even with freezing fingers or through thick gloves. All you need to do is find the sweet spot in the binding that is both tight enough for good control and slack enough to stave off premature frostbite. 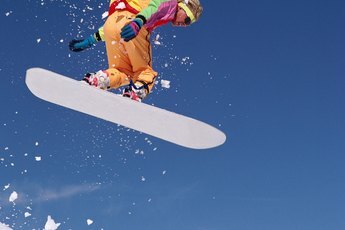 Get to a flat surface or position your board horizontally to the slope before starting to avoid slipping. If you are a beginner, sit down on the ground before loosening the straps until you are more familiar with the procedure. Lift the buckle of the toe strap to its open, vertical position. Grasp the strap and pull it slightly away from the buckle to loosen it. Realign the front of the toe strap around the front of your boot, then lower the buckle back down and ratchet it up until you are comfortable with the level of slack. Try to leave about an inch of strap from the ratchet to the baseplate for easier access later. Stand back up with your board still horizontal to the slope and shift your weight back and forth between your heels and toes to test the tightness. Both your ankle and toe straps should be centered over your boots, with your feet held firmly in place but not so firmly that you feel your blood being cut off. Once you've achieved the right balance of tightness, you're ready to get back on the slopes. 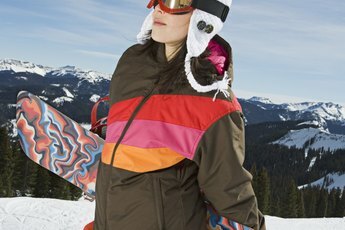 If you're using a new board, take a screwdriver or snowboard tool with you when you're on the slope. You may need to adjust the placement of the ankle or toe straps for maximum comfort and maneuverability.